Based on reviews from 2,952 users. Learn how our rankings work or see our guide to Supra sneakers. Updated Apr 2019. Skateboarding, per se, is considered serendipity if you look at its passionate origins and all the trouble ancestral surf pros had gone through. The drive to produce something out of nothing and innovating something out of pure enthusiasm creates a majestic product. Supra had nailed the prevailing idea and unconsciously started a trend that artists would deem treasurable. Though compared to prevalent global brands in the market, Supra is still an underdog but the sick reception and fast-paced marketing grind ollie the skate brand on top of the sneaker food chain. Let's take a 360 tour into the gory details of the California brand and prepare to be stoked with all its Supra sneaker glory. What do Supra sneakers look like in general? Sneaker brands like Supra credit their looks to their origins of skateboarding. Understanding that the founders of the sportswear also hail from the rebel sport gives us a kickflip view of its overall appeal. Though as the brand materializes and expands, several iterations with different focuses arise. A flat sole is essential for executing flips and tricks on the board due to its increased surface area and minimal material between the foot and the ground. Coincidentally, a flat sole also projects a streamlined appeal in a low profile vessel which is easy to fashion with. Supra capitalized in this fad and produced numerous versions of skate shoes that looks and feels good. The skatewear-to-fashion-statement look started with the Skytop, Chad Muska's unofficial Supra sneaker. Utilizing the flat, vulcanized sole, Supra sneakers infused artist-catching aesthetics which soon developed to be a staple street apparel icon. Many Supra sneakers slam down in the skate-driven category due to its founder's apparent inclination with the sport. Examples of Supra sneakers that bear the skatewear form are the Supra Chino, Supra Cobalt, Supra Flow, Supra Shifter, and of course, the Skytop series. Running is not much of a thing for skaters as they are continually landing the board. But as Supra sneakers expand their catalog and their audience diversify, they most likely have to comply with the change. Running-inspired Supra sneakers contain elements that are tweaked to deliver the performance of a lightweight athletic trainer. Most of these Supra sneakers carry low-top collars to administer freedom of movement in every twist and turn. Models under this classification are also constructed with breathable materials for maximum comfort while doing runs. Supra sneakers under this category are the Supra Noiz, Supra Owen, Supra Scissor, Supra Winslow, and Supra Hammer Run. The sophisticated and sleek designs of Supra sneakers were inevitably bound to penetrate famous high-end icons. It is only adequate for Supra sneakers to respond with fashion-forward designs and lifestyle-centric iterations for men and women to wear. Flashy accents and eccentric detailing is not a fiend for our dear friend Supra. Sneakers under the casual department usually accentuate aesthetics with a dash of Supra function. These Supra sneakers are typically constructed with premium materials of the unorthodox kind. Metallic components, zippers, and straps compose the Supra sneaker's exterior to give it an iconic flair. The designs that revolve around this category are somewhat intended for women, but it wouldn't hurt if men can rock a pair like the Supra Cuttler which was worn by Justin Bieber. Other examples under the casual class are the Supra Malli, Supra Catori, Supra Cubana, and many more. How are these Supra sneakers cut? The image of Supra sneakers started off with high-collar heights. As the brand's popularity progressed, more and more cuts were introduced which was also due given that Supra is a skate shoe manufacturer. Though low and high tops dominate the Supra sneaker portfolio, mid tops also account for few surprising iterations. Sneakers with low top collars allow maximum room for outrageous maneuvers and swift movements. Staying below the ankle also contributes to an overall low profile look which coincides with most outfit combinations. Supra sneakers bearing the low top form are conventionally lightweight to showcase adverse mobility while rocking a convenient look. It is visible in almost all styles and inspirations including casual, running, and skate inspired models. Most of these Supra sneakers are relatively cheaper due to fewer materials utilized in its assembly. It also employs fewer components for a minimalist look thus the achievable price tag. Supra sneakers cut below the ankle includes the Supra Ineto, Supra Shredder, Supra Chino Court, and a platoon of others. Mid-tops are seldom seen sported on the streets as casual wear because most of the time it is being worn as a basketball sneaker. Skating with these is also not a thing until thrashers started cutting Steve Caballero's signature Vans shoe into half. Supra, on the other hand, invested on the mid-cut style and used it in a platoon of iterations for skating and strutting the stage. Mid-tops are the perfect forms for skating because it yields enhanced protection for the ankle while leaving enough room for pivoting flip tricks and switches. Concerning styling for casual wear, a mid-top Supra sneaker displays enough chic but not too much to bonk over overdressed-status. Mid-top Supra sneakers are usually composed of those designs that lie under the casual and skate-inspired class. 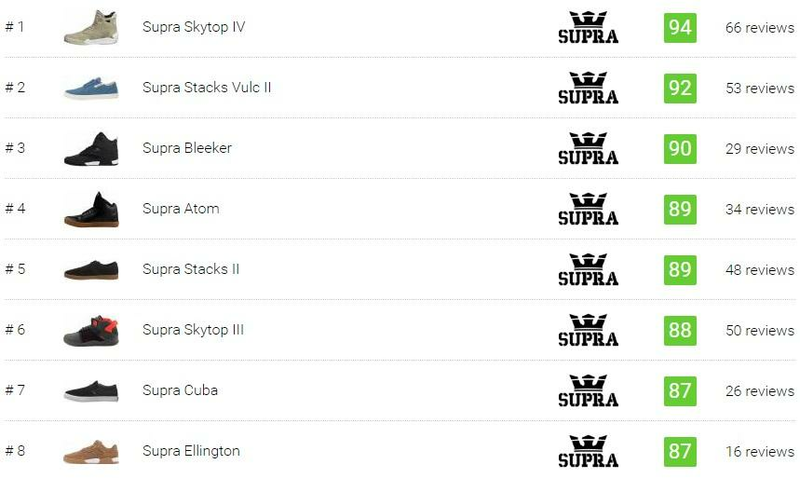 Some examples of these Supra sneakers are the Supra Atom, Supra Catori, Supra Kensington, Supra Method, and numerous other iterations. Supra owns their fame to this cut. First witnessed with the Skytop, as the name implies, has an ankle length that is skyrocketing and is best worn with the tongue flapping in front. But enough of the infatuation with the coveted Supra pioneer. High tops are explained further in the details below. High tops cover much of the ankle for complete lockdown and protection. As the name suggests, these sneakers are also priced high considering the number of materials utilized with its construction. The overdone tongue is a dead give away. Most of the Supra sneakers bearing the high tops are skate-inspired with rare deviancies like the Supra Oakwood which functions as a hiking boot. Though the style of high top Supra sneakers is intended for skating, its soaring appeal carried on as a streetwear fad. How do these Supra shoes fit? The fellows who built the gnarly skatewear brand really knows what they are getting into. It is evident with the consistent true to size fits of their Supra sneakers extending from low collar to the high tops. Mostly sticking to one's standard foot size would not cause much trouble when picking the right Supra sneaker. Below is a catalog of Supra sneakers that follows the standard sizing of the norm. Not everybody is perfect, and that includes California-based sports producers like Supra. Though most of their sneakers conform comfortably to the usual size of people's feet, few iterations bail out on the construction quality. The Supra TK Low Stacks Skate, Supra Malli, and Supra Hammer Run are known to run small. Other deviancies from the bunch are the Supra Vaider LC which is loose around the achilles, a bit of annoying long form of the Supra Shredder, and the Supra Noiz which runs large. To avoid such a dilemma, one can browse online for comments and reviews before purchasing a sneaker. A bulk of these statements includes a suggestion to go half a size up for those with wide feet or the opposite. Many of these Supra sneakers are also constructed in unisex sizes with women following the standard pattern of going down 1 1/2 sizes from the men's. How much do these Supra lifestyle kicks cost? With a brand mostly recognized by celebrities and musicians, Supra sneakers never let the limelight get a hold of themselves. Selling at a very reasonable price range, Supra sneakers are on point when delivering style at an affordable cost. Supra sneakers range from the cheapest Supra Cobalt at $55 to the most flashy ones like the Supra Strapped NS which is adorned by pop icons. Most of these wallet-friendly Supra sneakers are low tops as fewer materials are utilized in its assembly. Being lightweight is also a plus for manufacturers because fewer components should comprise a low top Supra sneaker. There exceptions to the rule like the Supra Strada which is a high cut shoe that only costs around $65. Collaborations and themed releases commemorating icons and events are a bit expensive due to the uniqueness it delivers. Supra sneakers, given it, attracts high-end individuals, embraced this idea and produced iterations that are limited editions. Though the skate apparel producer has internal collaborations with its founding members, Supra sneaker offerings like the Supra x Disney Skytop are priced a little above the average pay grade at $145. A prestigious brand like Supra would surely have a rich line-up of savvy yet fully functional skatewear. Before 2007, skaters dip their feet with brands like Vans or Nike SB or any other brand like DC, Converse, Etnies, and more. Its fame and fortune today can be accounted for by several of its designs released in the past. But of course, the Skytop would be the one on top of the list. Probably the most well-loved model from Supra is the Skytop. By giving skaters a chance to renovate the skatewear norm, the Skytop was designed flawlessly while not sacrificing brilliant features and an all-around function. The Skytop was the brainchild of Angel Cabada, Chad Muska, and designer Josh Brubaker. Released in 2007, the Skytop revolved around the trio's concept of a sneaker made by them, for them. A collaborative effort to create a dope skate kick was the first thing in mind. A rather extreme collar length was the selling point of the Skytop and first featured the coveted SupraFoam in full-length. The sneaker also embodied the ingenious idea of a hidden pocket on the tongue which was first witnessed in the KangaROOS shoes. Muska was the pioneer of this idea of including a "stash pocket" when he designed his signature shoe called eS Muska in 1998. For enhancing performance, the Skytop contains elastic tongue straps to keep the foot in place coupled by a mesh liner for comfort and breathability. Skaters found the shoe to be efficient while artists like Lil Wayne, Kanye West, and Jay Z treat it as a flashy new option for their wardrobe. The growing popularity momentum of the Skytop triggered a sequel by the likes of the Supra Skytop II. The subsequent model was feared to undersell; following the prevailing notion that original models would supersede its fame, but the strong inclination of the sneakerhead crowd proved it otherwise. Keeping true to its roots, the Skytop II was even made lengthier regarding height. Adding a diagonal cut to its sleek low profile body, the Skytop II encompasses most sneakers during the time with its towering tongue. The coveted second addition to the Skytop series was the spark plug of expanding the Supra sneaker franchise. The Skytop II was introduced in 2009 and was available in limited and general releases. Muska and the design team never knew that both kinds would sell like pancakes with even a few colorways sold out in thirty minutes. To increase performance, the II maintained the SupraFoam midsole while adding a high memory polyurethane insert and an Internal neoprene sleeve. Justin Bieber was seen rocking in these in a fashion magazine called UpscaleHype and was an unintended gesture to boost its icon status. The most famous colorway was the Gradient II which was limited to only 600 pairs. As the years unfold and the millennial thinking overthrew shoe function over style, sneakers became a reflection of what's hip and what's not. It was timely and fortunate for another Supra sneaker to surface beyond this zeitgeist of vanity. Deviating from the usual trend, the 3rd model of the Skytop got back to its history of skateboarding and delivered a fully-functional product. From the classic high tops of the I and II, the third installment of the Skytop series reverts to a mid-top form complete with lace cages and ollie protection patches at the toe. For added comfort, an EVA pod is situated at the heel intended for high impact protection which sits on top of a rubber cupsole. The sneaker was released in 2011, showing up on Supra's online store. Among the earlier inclusions to the Supra sneaker think tank, Erik Ellington provided the brand with a meaningful amount of insights way back January 1, 2006. Now that he had the opportunity to design his first named Supra sneaker, Ellington did not disappoint. According to Erik, he wanted to stay true to the first shoe he designed albeit creating an image similar to the red-dipped toe of his first sneaker. Function and style were mixed in a contemporary way in this supreme mid-top Supra sneaker enhanced by the generously padded collar with breathable mesh panels. It is also constructed in a cupsole to provide superb longevity. The TK Society is Terry Kennedy's sneaker and was probably the reflection of his unparalleled enthusiasm for everything. The high top's smooth design was given life in numerous colorways, and custom revamps seen on Bieber's feet. The Supra TK society is a combination of Kennedy's nickname and part of his clothing line's title which is Fly Society. It utilizes two velcro straps that wrap across the high top ankle shaft. Aside from the traditional SupraFoam midsole, the sneaker is packed with a high memory polyurethane (PU) sockliner. To fulfill the all-around comfort, the Supra sneaker uses a bootie construction conjoined by an Internal lacing system with neoprene lining. It was a bold step for a skate brand to produce something out of the ordinary. The Supra Hammer Run proved that Supra sneakers could grind across enterprises including running. With a current logo of "always on the run," the Supra Hammer Run was an iconic addendum to Supra's sportswear portfolio. Derived from the Supra Hammer which is Jim Greco's signature Supra sneaker. The Hammer Run took the pure aesthetics of its low top predecessor and gave it an athletic upgrade using mesh for its upper that sits atop of a SupraFoam outsole/midsole. Going back to the basics was the prominent notion for the Supra Vaider. Coming in high and low top forms, the Vaider was one of the Supra sneakers that are redone in a myriad of colorways. The Vaider is the son of the Supra Raider, which was one of the first models released by the Cali-based skatewear producer. The Raider was brought back and redesigned with a vulcanized sole thus giving rise to the Vaider. Numerous material variations had been seen with the Vaider including suede, mesh, leather, and others. And yes, it makes use of Supra's patented SupraFoam cushioning system for utmost comfort. Other sub-iterations of the Vaider are the Supra Vaider LC which is a low top and the Supra Vaider Cold Weather. A newer version was also released called the Supra Vaider 2.0. Found below are most searched inquiries found around the internet or as Bush would say it, in the interwebs. Where can I buy Supra shoes in New York City? The Big Apple offers a good selection of boutiques and stores for Supra sneakers and the likes found across the city. Official outlets Journeys and Blades exhibit a whopping display of Supra sneakers. It also wouldn't hurt to check DNA Footwear, Zumiez, and Rime East for other Supra colorways. Where can I buy Supra footwear online? With the growing imitation fad for Supra sneakers, one cannot help but doubt it's quality while ordering online. Several trusted retailers like Zappos and 6pm deliver an excellent product catalog along with the Supra sneaker official site suprafootwear.com. KSGB or K-Swiss Global Brand acquired ONE-Distribution in 2015 which owns the KR3W clothing line and Supra. The offices of ONE-Distribution are located in Dongguan (China), Spain, Sydney, Australia, Barcelona, and Fountain Valley California. Supra was first launched in 2006 as spearheaded by Angel Cabada, the co-founder of ONE-Distribution. Cabada established in California alongside several people including Jim Greco, Erik Ellington, Chad Muska and a few others. How to clean white Supra shoes? Depending on the material, there are specific ways to cleanse or restore the shine of white Supra sneakers. Suede is the most challenging component to handle because of its repulsion to water. Using a suede brush is the most ideal option, but others can make use of a damp towel while gently rubbing the grime. Remember to stroke in one direction so that the suede fibers would not rumble. The most convenient material to whiten is textile and mesh due to its fabric nature. Using shoe restoring agents should do the trick. Leather overlays covered in dirt can be wiped down easily using a damp cloth. Does Justin Bieber wear Supra sneakers? Yes. Justin Bieber was one of the artists that religiously wore Supras during his prime days. Below is a list of the models that the Canadian artist sported during red carpet scenarios or open sessions along streets. Which Supra casual sneakers does Lil Wayne wear? Since the early days of their relationship, Supra and Lil Wayne had been benefitting from each other stylishly and market-wise. During red carpet scenes, Lil Wayne can be seen rocking a pair of Skytops. In 2013, the rap artist introduced the Supra Chimera which is a high top sneaker packed with an enlarged tongue. A collaboration model was also released in the form of the Vaider which formally goes by the name of Supra x Lil Wayne Vaider Lite. What are examples of signature shoes under the Supra brand? How to spot a fake Supra sneaker? With the growth of its popularity, Supra attracted a lot of counterfeit nuts along the way. Soon Supra sneakers began sprouting like wildfire on vast retailers which some were discovered to be coming from China. To avoid all these hullabaloos, Supra has provided a detailed distinction on the original Supra sneakers on their site. To summarize Supra's guideline page, one must first start inspecting the box where the Supra sneaker came from as it already provides clues if the shoe is a counterfeit or not. Leather materials should be premium and not plastic-looking, and the seams should be cleanly cut. Generally, original-made Supra sneakers should not look puffy and bloated. Lastly, the SupraFoam must be generously padded as compared to fake ones which are almost as thin as cardboard.